Thermal stores and heat banks provide hot water at mains pressure, giving excellent performance from showers and spray mixer taps. They don't require bulky tanks in the attic, which can free up space. "Unvented" (e.g. "Megaflo") systems also give these benefits but their installation has to be notified under Building Regulations and they must be serviced annually for safety, so thermal stores are particularly attractive for DIY-ers. Thermal stores are also used in applications where heat sources are combined, e.g. mixing solar or solid fuel with conventional boilers, and sometimes also for supplying underfloor heating systems alongside radiators. 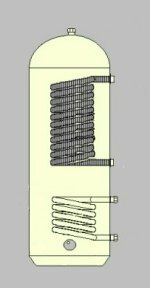 In a classic thermal store the heat exchanger is a coil of pipe with a large surface area within the cylinder itself. As cold water flows through the coil it is heated by the hot water surrounding it and as the surrounding hot water cools it sinks by convection bringing hot water from elsewhere in the cylinder into contact with the coil. 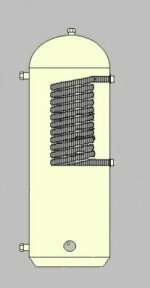 In another type of system, sometimes referred to as a heat bank, the heat exchanger is external to the hot water cylinder. When DHW is required hot water is pumped through the heat exchanger and back into the cylinder. The pump is usually controlled by a switch in the DHW pipework which senses when water is flowing to the hot taps etc. 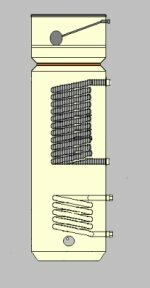 In this type of design the heat exchanger is usually a type comprising several plates of copper joined in a sort of multi-layer sandwich, known as a Plate Heat Exchanger (PHE). In this document when comparing the two types of system we refer to them as thermal stores and heat banks, but elsewhere (e.g. when comparing these kinds of system with unvented and conventional) we refer to them generally as thermal stores. Clearly a Thermal Store, with its internal heat exchanger and no moving parts, is simpler than a Heat Bank, with its pump, heat exchanger and flow switch. On the other hand Thermal Stores may be more prone to scaling-up in hard water areas. When there is no demand for DHW the water in the heat exchanger coil is raised to the temperature of the Thermal Store, whereas in a Heat Bank the heat exchanger cools towards ambient temperature when there is no DHW demand. Also, even if the heat exchanger of a Heat Bank does become scaled up it can be removed for descaling or replaced if unserviceable, whereas the heat exchanger of a Thermal Store is an integral part of the appliance. Since the heat exchanger and pump are outside the heat bank they can be sited remotely from the bank, closer to the point of use if wished, reducing hot water delivery delay and wastage of water and heat due to the "dead leg" of cool or cold water in the DHW pipework. 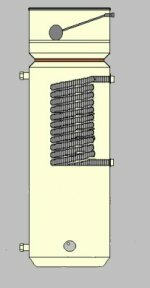 One can also have multiple heat exchangers drawing from the same heat bank, e.g. supplying widely-spaced locations requiring DHW from a heat main carrying hot primary water around the building in well-insulated pipework to instantaneous DHW heat exchangers close to the points of use. Such a heat main may also supply radiators, UFH etc so that only one pair of pipes is required to cover the whole area of the installation for both heating and hot water. This sort of arrangement is also suited to space heating with multiple zones. A Heat Bank may be built out of fairly standard components rather than as a custom assembly, making it attractive for DIY. Another difference between Thermal Stores and Heat Banks is in how efficiently they use the amount of hot water they contain to provide DHW. This concerns stratification and mixing of water in the store, explained in the box below. The net effect is that a Heat Bank must have a higher capacity than a Thermal Store to provide the same quantity of DHW (if all other factors are equal). the heat exchanger is perfect, i.e. there is no temperature drop across it. As DHW is heated it will rise to 70°C (when the store is fully heated) and will cool the water in the store to 10°C. If the cooled water is thoroughly mixed with the hot water the whole store will progressively cool until it reaches 40°C after which the temperature of the DHW becomes unacceptably cold. However if the water cooled to 10°C is kept separate and only the water at 70°C is fed to the heat exchanger then the DHW will continue to produce acceptably hot water until the whole store contains only water at 10°C. In the first scenario the amount of heat available by cooling the store from 70°C to 40°C is available for heating DHW, while in the second the amount of heat available is that of cooling the store from 70°C to 10°C. This gives much more DHW for a given volume of store at a given temperature. Stratification, where the cool water at the bottom of the store remains relatively separate from the hotter water further up, provides a means of approaching this goal. Circulation of water in a a thermal store is driven by convection currents caused by the cooling effect on the stored water of the cold water flowing through the heat exchanger. These convection currents are relatively gentle, and proportional to the amount of heat being drawn from the store. Thus the cooled water tends to fall gently to the bottom of the store leaving hotter water higher up, nearer the heat exchanger. As the store continues to supply heat to DHW the cooler layers of water extend further up the cylinder until at some point, when much of the heat exchanger is surrounded by cooler water, the temperature of DHW drops below 40°C. At this point there will still be some hot water near the top of the cylinder, so the thermal store is not using the stored hot water with perfect efficiency. 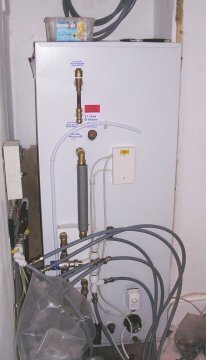 In a heat bank water can be drawn from the very top of the cylinder to pass through the heat exchanger, so all the stored hot water should be available for heating DHW. Unfortunately most DHW heat banks use a simple fixed-speed central heating circulator switched by a flow switch in the DHW pipework. This has to provide sufficient flow through the heat exchanger to provide satisfactory DWH temperature at maximum DHW flow rate, so even when the demand is less the pump is still circulating water at its maximum rate. This causes unnecessary mixing in the cylinder, destroying stratification. This disadvantage is not inherent: it would be possible to control flow rate through the heat exchanger to the rate necessary to give the required DHW temperature. This could be done either electronically, by controlling the pump speed, or mechanically by restricting the flow through the pump and heat exchanger (e.g. by a mechanism similar to that in thermostatic radiator valves). Conventional cylinders used with boilers and central heating systems are indirect types because the primary water must be kept free of oxygen and may be treated with corrosion inhibitor and other chemicals. However in thermal stores and heat banks the water in the cylinder heats DHW indirectly through a heat exchanger so the water in the store can be the primary water shared with the boiler etc. This allows the store to recover as fast as the boiler can generate heat. Also, since there is no temperature drop between the boiler and the stored water (as there is across a primary heat exchanger) the boiler can run at a lower temperature to keep the store at its desired temperature. This allows slightly greater efficiency of operation with high-efficiency condensing boilers. This arrangement does, however, require that the primary circuit be vented (since an unvented system would place the storage vessel under pressure, as in unvented DHW systems). In practice this means a small header tank is required above the highest point in the system i.e. above any radiators on the top floor. Gledhill thermal store product info (independent site run by heating engineer Mike Bryant, not by Gledhill). This page was last modified on 15 January 2012, at 23:09. This page has been accessed 65,948 times.